We're happy to offer our DC readers the chance to attend a free advance screening of Dog Days, the new canine comedy starring Nina Dobrev, Vanesssa Hudgens, Eva Longoria, Finn Wolfhard, and Adam Pally. 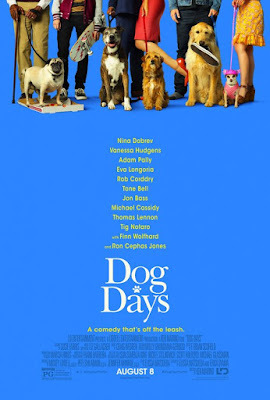 SYNOPSIS: From acclaimed production company LD Entertainment (The Zookeeper’s Wife, Jackie, and Megan Leavey) and Director Ken Marino comes Dog Days. Dog Days is a hilarious and heartfelt ensemble comedy that follows the lives of multiple dog owners and their beloved fluffy pals around sunny Los Angeles. When these human and canine’s paths start to intertwine, their lives begin changing in ways they never expected. The screening takes place on Monday, August 6th at AMC Mazza Gallerie at 7:00pm. If you'd like to attend, simply register with the Gofobo ticketing site here. Please remember having passes does not guarantee entry, and you'll need to arrive early to ensure receiving a seat. Enjoy the show! Dog Days opens August 8th.